Here’s a portrait of a conversion rate. It means my site it finally doing what it should – filtering out time-wasters and channeling potential buyers to the purchase page. This is over two days – 40 visitors to the main page, 9 continued to “about”, which describes the product in greater detail, a total of 7 either to Chapter Previews or Download Info, both of which quote the price for the first time, and finally one to Order. I’ve started saying “download now” instead of “pre order” because I want to make sure there’s no dropoff if people assume it’s available right now. So I’m back to one hypothetical “order” per day, which means it’s into production. I’ve abandoned strict crowd funding for now, in favor of selling a self-produced first edition (which I’m honest about in the disclosure), and using some of the eventual proceeds to produce the final product. 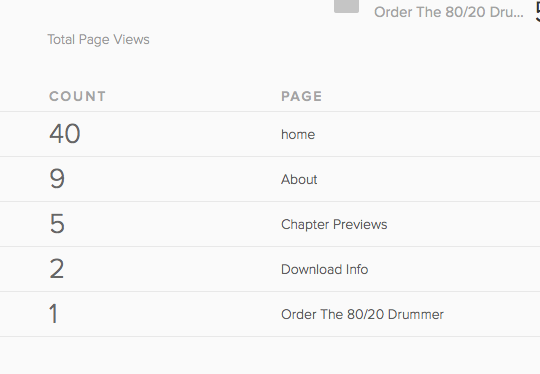 Again I have to beg that no visitors to Breaking Ferriss visit the 80/20 Drummer site because I want to make sure all the page hits are “real”, not Breaking Ferriss readers browsing. Once I have product up live, I’ll invite everyone (all 3 or 4 of us;) to visit. Which hints at my next business move. Yes, we’re back to shoes. But not like before. We’re actually sourcing them from retailers in Taiwan, provided they’ll work with us. The text is copied verbatim from the French Sailor Shirts example in Four Hour Work Week, and the 2.00% Click Through rate is good. Today I’ll be putting up the landing page for conversion testing – seeing what percentage of visitors actually click “purchase”, and I expect a lot of tweaks will be necessary. Shoes are a very specific thing – what if the size is wrong, or you don’t like the material once it arrives – requiring size guides and return/exchange policies. I plan to copy the content from other successful shoe sites more-or-less verbatim (I’m not talking plagiarism – I’ll paraphrase, but things like “60 day return policy” aren’t really intellectual property anyway), and use an existing Squarespace template for sales, changing as little as possible. I may not be good at selling yet, and I may be a “sourcing virgin”, but one thing I know how to do is validate in a hurry. If I can’t get the landing page up in two hours, I’m doing something wrong.